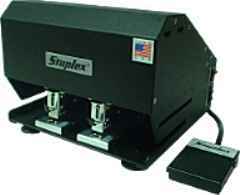 Model S-620NHL includes automatic contact assembly that activates when material hits microswitch on the right side of the right stapling head� requires a minimum 3/4� distance from right edge of material to the right leg of the right staple to activate microswitch. -Now with "pop-out" front loading! Stapling heads are reversible for stapling the smallest header cards (3" [7.6 cm] wide) while holding materials in one hand! Has the housing front cutaway so that the stapling heads protrude, and the right and left sides of the stapling heads are cut away to allow stapling close to the bottom for the fold flap while allowing the operator to hold his thumb and index fingers at the bottom corners of the fold. Completely portable. No mounting required. Weight: 19.2 lbs. (8.7 kg) Dimensions: 9-7/8" wide, 9-3/4" deep, 7-3/4" high (25.1 cm x 24.8 cm x 19.7 cm). 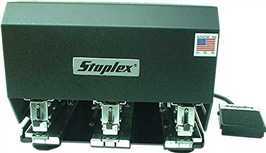 Other models available for special applications.Special backstops and side guides available for foot switch models on special orders. 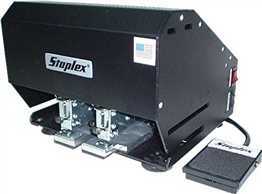 Drives three staples at once automatically when work is inserted ! 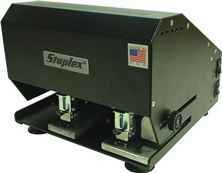 Fully adjustable center distances between each staple from 2"
Completely portable. No mounting required. Weight: 26‑1/4 lbs. (11.9 kg). Dimensions: 9-7/8" wide, 9-3/4" deep, 7-3/4" high (25.1 cm x 24.8 cm x 19.7 cm). 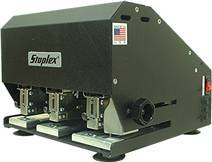 Dual Capacity Models use both Staplex® Type DS 1/4" Staples and Type LL Long Leg Staples. Special backstops and side guides available for Footswitch models, on special order.